Using proprietary processing techniques, the healthiness of peanuts and wasabi takes on new dimensions of taste and texture with a unique crispy coating. Produced in a facility that handles crustaceans, molluscs, fish, milk, nuts, mustard and sesame. Ingredients: Peanut (40%), Glutinous Rice Flour, Wheat Flour (Contains Gluten), Sugar, Soy Sauce (Soybean, Wheat Flour (Contains Gluten), Salt, Water), Palm Oil, Wasabi Powder (1%), Colours (Turmeric, Copper Complexes Of Chlorohphllins). 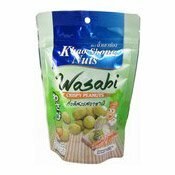 Simply enter your details below and we will send you an e-mail when “Crispy Coated Peanuts (Wasabi) (日本芥辣花生)” is back in stock!